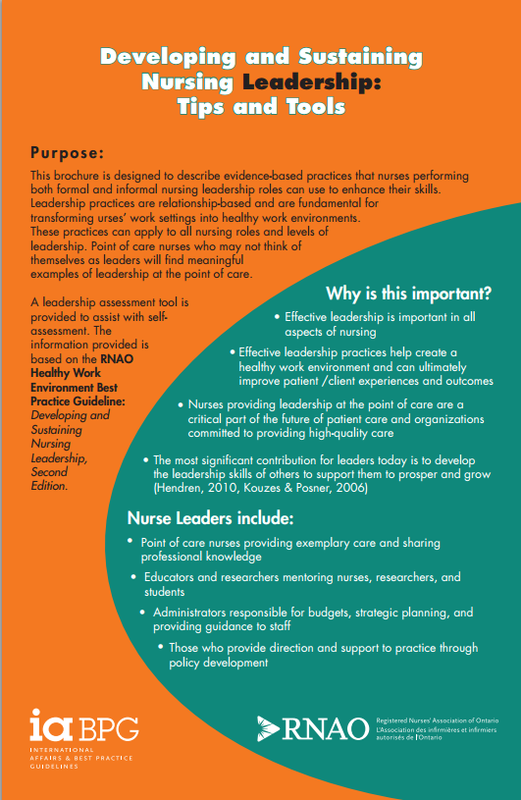 These brochures (Developing and Sustaining Nursing Leadership Tips and Tools & Point-of-Care Leadership Tips and Tools for Nurses) are designed to describe evidence-based practices that nurses performing both formal and informal nursing leadership roles can use to enhance their skills. 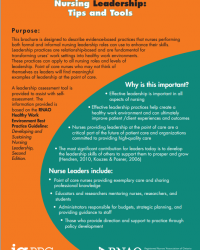 Leadership practices are relationship-based and are fundamental for transforming nurses’ work settings into healthy work environments. These practices can apply to all nursing roles and levels of leadership. Point-of-care nurses who may not think of themselves as leaders will find meaningful examples of leadership at the point-of-care. For Tips and Tools on point-of-care leadership please see PDF below listed under the related files section.